Yesterday was Day 1 of Gumroad’s awesome Small Product Lab challenge, which is a very cool creative mix of “course” and “competition” where participants design, create, and launch a small product in only 10 DAYS! The idea is to get over the stumbling blocks that trip a lot of folks up and just finish a small product that you can sell. It’s an awesome concept, and I’m one of many creative folks rocking out wild and creative projects this week. Though I’ve already created a lot of Kindle books, sold almost $1,000 worth of assorted projects on Gumroad, designed a few games, and am hard at work on several Udemy courses, I couldn’t pass up the opportunity for this exciting challenge. I’m about to dive into my work for Day 2, and I’ll plan to blog my progress as I go every few days. Going into day one, I already had a loose sense of what I wanted to tackle for the project. I’d been toying with the idea of doing a short info product or mini-course explaining how to create short videos and…build a short mini-course. Very meta! As I’ve been working on building out my upcoming Podcasting for Authors and Writers Udemy course over the past year, I’ve come up with a simple, effective, and affordable system for creating great video content, audio content, and written scripts all as part of the same process. I wanted to show others just how easy it is to hone in on a sellable skill they have, and teach others how to do it (while making money) by creating great videos and building out a simple online course. Gumroad’s SPL is a step-by-step process that unfolds a little each day, but a lot of people seem to be getting a jump start on it, at least in terms of planning. Over the weekend before the Small Product Lab began, I sat down and create a very rough outline for what my course could entail, with an eye towards adding value while keeping it as streamlined as possible. Section One focuses on identifying your sellable skills, brainstorming course ideas, researching and testing the potential market for those ideas, and then crafting your outline and course script. Section Two focuses on the step-by-step process of recording and editing your audio lectures, creating powerpoint-style slides, and editing them all together into short top-notch quality videos (that don’t require you to be on camera, thankfully). Section Three focuses on the final steps and considerations for creating promo art for your course, pricing, launching it, and marketing it. Because my (probably a little ambitious) vision for the product includes both video and a PDF ebook for the course, I decided to hit the ground running. Having an rough outline, a loose title, and a focused battleplan on Day One really helped me focus and rock out the word count. On Day 1, I followed the steps in the first SPL email and spent some time evaluating my idea and considering other options. But after a bit of google keyword research on my subject and title, I solidified my resolve and dove in. 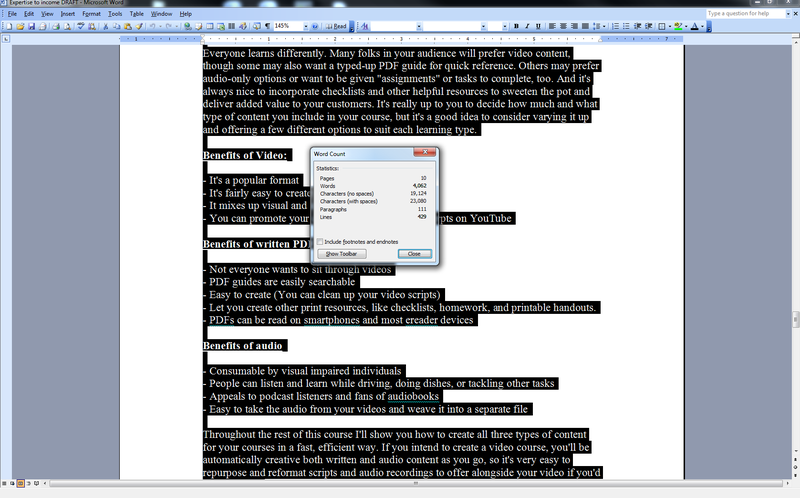 I wrote just over 4,000 words and really pushed hard to create a large chunk of my script and ebook for the course. That was exhausting, but I’m happy with the content I created. I’ll likely have to go back and edit it a bit, but it’s pretty polished for a draft. My goal is to get the script and ebook roughed out entirely within three days, so I can have time to market and do other tasks along the way. Later this week I’ll be starting to record and edit the videos for the course. It’s going to be a wild ride! Wish me luck and don’t forget to stop back here to see how it’s coming along!